This moist and flavorful orange pumpkin gingerbread bundt cake can be made 100% whole grain and dairy-free and is soaked in a buttery orange sauce! This bundt cake is perfect for Thanksgiving! It yields a huge cake that can feed a crowd, no decoration is required and it stays moist overnight. One less thing to worry about on Thursday! But most importantly, it’s ridiculously delicious. I’ve been making this cake for about 6 years. It transformed from a pumpkin bundt cake to pumpkin gingerbread to orange pumpkin gingerbread. And for the book, I wanted to add something a little extra. So now it’s one of those recipes where you poke holes throughout the cake and then pour in a sugary flavored sauce. It’s great without but with the sauce?! So much more tasty but I guess butter, sugar, orange juice and vanilla tend to have that effect on things. If you want to keep this cake dairy-free, you can use refined coconut oil, which is tasteless, or some kind of vegan butter sub in the sauce. I normally use whole spelt flour but I’ve also made it with whole wheat, white whole wheat and all-purpose flour. My apologies that I haven’t tried a gluten-free version, yet! I’m guessing Bob’s Red Mill 1-to-1 gluten-free baking flour would work but since I haven’t tried it, I can’t make any promises. It’s worked in everything else I’ve tried, though. Adjust oven rack to lower third of the oven. Preheat the oven to 325°F (163°C) and spray a 12-cup (10-inch / 25 cm) bundt pan very well with cooking spray. In a large mixing bowl, mix together the dry ingredients (flour through salt). In another large mixing bowl, lightly beat the eggs and then add the remaining cake ingredients. Stir until thoroughly combined. Add the dry mixture to the wet mixture, and stir just until combined. Pour the batter into the prepared pan and bake for 60 to 75 minutes, or until a toothpick inserted in the middle of the cake comes out clean. Let the cake cool in the pan for 10 minutes and then invert onto a wire rack. Wash and dry the bundt pan. While the cake is cooling, prepare the sauce. Mix all of the sauce ingredients together in a small saucepan and heat over medium heat until the sugar has dissolved and the butter has melted. Place the washed and dried bundt pan back over the cake and flip over to invert. Using a thin skewer, poke holes almost all the way to the bottom the cake. The holes should be about 1 inch apart. Slowly pour the hot orange sauce over the cake. Serve immediately or let the cake sit in the pan until fully cool. Invert onto a serving plate, cover, and store at room temperature for up to 3 days. Do not store the cake in the pan as the sauce will make it difficult to remove! For dairy-free, use refined coconut oil or vegan butter. 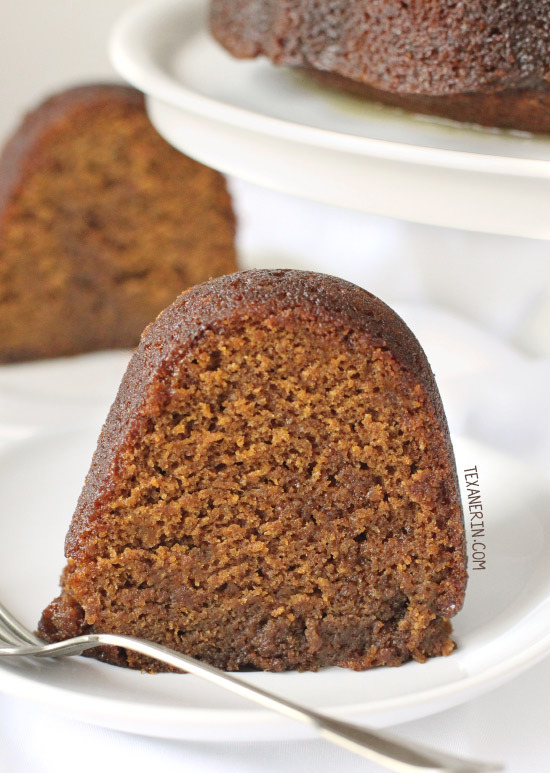 53 comments on “Orange Pumpkin Gingerbread Bundt Cake (whole grain, dairy-free)” — Add one! I dropped the honey and sugar but it came out perfect anyway. Beautiful consistency and flavor. You totally omitted it?! Or just reduced it? Either way, I’m happy it worked out well. :) Thanks for your tip! This looks amazing. Has anyone tried switching out applesauce for the oil? Thanks! I haven’t tried it but assume it’d make the cake less moist. Hey Erin, I made this cake today. Oh it smelled so good while baking….it’s a shame I have to wait until tomorrow to eat but the flavors will probably be even better tomorrow. I do have a question for you and I may come up with a solution before you wake up and answer me but I noticed in your instructions you have only to grease the pan and my mother and I have always had trouble getting stuff out of bundt or tube pans with only greasing so I greased and floured the pan and I now see the error of my ways. Cause it isn’t all that pretty anymore. I am hoping that maybe soaking the cake until it cools will help with that. But then I thought about making some more of that butter/orange sauce and see about pouring the sauce over the cake and let it absorb a little…perhaps that can minimize the look of flour on the cake. I actually didn’t do anything special to it. I flipped the cake back into the pan and poured the sauce over it and just let it sit for quite awhile before flipping it back out onto a cake plate. None of the flour showed at that point. So it worked well….mine was however, a bit dry. Next time I’ll make a little more sauce for it! Aww, darn! It’s definitely not supposed to be dry, even without the sauce. I actually made this cake without any sauce for years before I figured that adding the sauce may make it even nicer. I’m happy the flour situation worked out well! I wanted to bake something to bring to a dinner party , but realized I only had buckwheat and spelt flour in my pantry. So glad I gave it a shot – This cake turned out exactly like the pictures. A definite keeper! I’m so happy that it came out just like in the pictures. :) I hate it when I make something from a blog and it looks nothing like the pictures! Thanks a bunch for your feedback and I hope the people at the dinner party enjoyed it. I made this recipe in muffin form and it was delicious. Even sent some to school for my daughters class for “Thanksgiving”. I only wish I could get more of the icing into the cake. It was so good. Kids loved them too! I’m so happy that you enjoyed them! And I hope your daughter’s classmates liked them, too. :) Thanks so much for your feedback! I cut the recipie into half and the cake turned out amazing. My 5 year old absolutely loved it. This is going to be my go to thanksgiving dessert. Thank you for the wonderful recipes you share. I’m thrilled that you enjoyed it so much! And I’m especially happy to hear that it’s your new go to Thanksgiving dessert. :) Thanks a bunch for your feedback! This is stunningly gorgeous. But how did I miss this news about your sniffer? I can relate, sort of, I lost my eye sight for a few days due to an operation and it was weird and very disconcerting. I’m off to read about this. Then off to make some gingerbread bundt. Well it wasn’t news exactly. ;) And oh my. I would have been terrified had I lost eye sight for a few days! Thank goodness it came back and you’re okay now. That does it. I absolultely need a bundt pan. I love the orange in this! Gorgeous! Orange and gingerbread are such an awesome combo, and I bet that pumpkin can only make it better. It looks so moist and tempting! This is a gorgeous cake and will be made this holiday season. It looks fantastic! The scent of gingerbread baking in the oven just screams holidays to me. The pumpkin included is a nice, nutritious twist on a holiday classic. What a stunning fall cake! To me, nothing smells more like Christmas than gingerbread baking in the oven. It’s glorious! You cake looks incredibly moist. No need for any topping. It’s perfect just as it is!! I will try with GF flour, unless you have already determined this is a bad idea. It looks like the perfect cake! This is one beautiful looking cake! And I especially love how simple it is! This looks like a perfect holiday cake for the fall and all the way through the winter. It would be so good with a homemade cream cheese frosting too! Yum! Cream cheese frosting is almost the only frosting I really love! So, so good. Oh my word. I can practically smell it through my screen! This cake sounds totally dreamy! 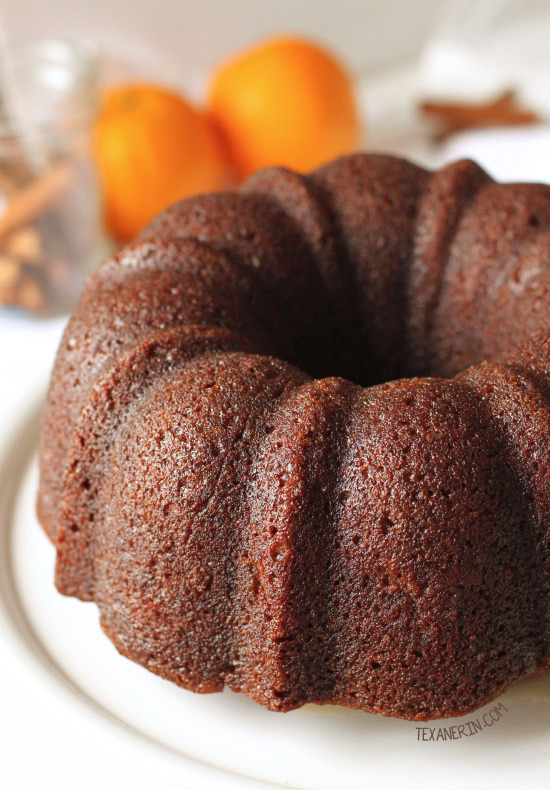 With all these spices and pumpkin this bundt cake must be very yummy! I’m always ready for a new bundt cake recipe! I can’t ever turn one down during the holidays. They are so simple to put together and look elegant even undecorated. A nice version for the fall, Erin! Such a gorgeous Bundt cake filled with layers of holiday flavors! OK, no joke…I am working on a similar recipe from my favorite pumpkin pound cake. The recipes are entirely different, but the orange zest and spices are in common with the pumpkin. Sooo good! Cannot wait to make your Bundt cake full of all my favorite holiday flavors! Thanks for sharing, Erin. :) Have a fun and meaningful Thanksgiving Day holiday! What a beautiful cake! This would definitely be perfect for Thanksgiving dessert. I love the addition of orange to brighten up the flavor here! You had me at no decoration needed! I always make a mess with toppings and icings so this simplicity is perrrrfect! It looks DELISH!